The EOS C200 Digital Cinema Camera is a "ready-to-go" production camera that comes with a built-in electronic viewfinder and an array of accessories including a 4-inch touch screen LCD monitor, a versatile handle and ergonomic handgrip. 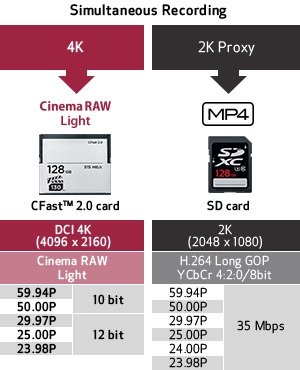 The camera can record internal 4K RAW to a CFast™ 2.0 card in our new Cinema RAW Light format without compromising detail, as well as 4K UHD and Full HD in MP4 format to SD cards. The 8.85 Megapixel Super 35mm CMOS sensor, 13 stops of dynamic range, Dual Pixel CMOS AF, full compatibility with Canon EF-mount lenses, and HDR capability help make the EOS C200 ideal for film, documentary and television production, corporate and event videography, and newsgathering. The camera's multitude of features helps deliver outstanding image quality, performance and versatility. The EOS C200 is an ACES Compatible product. Click here for more information. 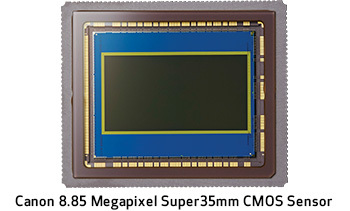 Each pixel in this CMOS imaging sensor also maintains a wide pixel pitch that maximizes the amount of light that falls on to each photo site, thus enhancing the EOS C200 camera's sensitivity while also minimizing noise and supporting ISO speeds of up to 102,400 for extreme low-light imaging. This sensor also reduces data-readout time, resulting in a reduction in rolling-shutter artifacts. A major aspect of the creative filmmaking potential of the EOS C200 Digital Cinema Camera is its compatibility with the full range of more than 100 Canon EF and EF-S photographic lenses (including specialty tilt-shift and fisheye models) and Canon's 4K CN-E Cinema prime and zoom lenses, including the “ENG-style” Canon CINE-SERVO and COMPACT-SERVO zooms. Improved EF lens communication capabilities of the EOS C200 camera provide the display of CN-E Cinema lens T-values, compatibility with Dual-Pixel CMOS AF, lens metadata acquisition, and chromatic aberration correction. 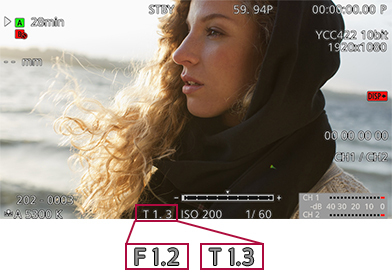 For those users who are accustomed to seeing the T-value displayed when using EF lenses for digital cinema, it is possible to switch the camera to display either the F-value or the T-value. This is important for those that shoot on movie sets and prefer to know how much light is passing through the opening of the lens and actually making it to the sensor. T-values are the traditional measure of light reaching the sensor in video production, while F-stop is the measure of light in still photography. The ability to see the F-stop helps those transitioning from still to video shooting. The EOS C200 Digital Cinema Camera is a “ready-to-go” production camera, right out of the box. 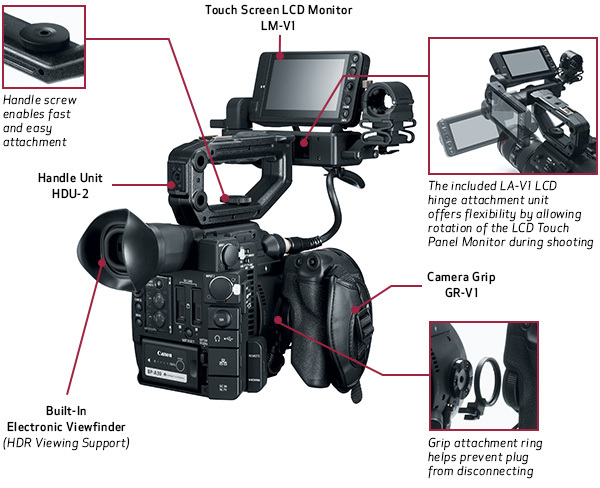 The camera comes with a built-in electronic viewfinder, along with a 4-inch Touch Screen LCD Monitor (LM-V1), Camera Grip (GR-V1), Handle Unit (HDU-2) and Battery Charger (CG-A20)- all helping make the EOS C200 ideal for single operator shooting applications including film, documentary and television production, as well as corporate video and event videography work and newsgathering. The 0.46 inch, 1.77 million dot built-in electronic viewfinder has a full array of menu options for controlling camera settings, and supports HDR viewing. 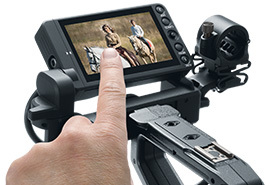 The fully adjustable and detachable, 1.23 million dot, 4-inch Touch Screen LCD Monitor works with Canon's exclusive AF technologies for easy monitoring and one-finger "tap-focusing" during shooting. The new Rosette style camera grip makes rotating and removing the grip simpler, and features an improved ergonomic design to help steady and focus the camera. The EOS C200 Digital Cinema Camera features our newly developed dual DiG!C DV 6 image processors, which powerfully process high-resolution image data. The two on-board DiG!C DV 6 image processors allow for the recording of 1,800 horizontal TV lines in 4K. The DiG!C 6 is Canon's sixth-generation Image processor that uses proprietary technology, allowing users to achieve high performance and creative freedom when acquiring images. The EOS C200 features Over Sampling HD Processing*, a high-image-quality signal processing system that satisfies a broad spectrum of video production needs by effectively utilizing the abundant powers of 4K image expression in 2K (2048 x 1080) / Full HD (1920 x 1080) recording. * Over Sampling HD processing is not available with Cinema RAW Light recording or 120p/100p. The EOS C200 supports an ISO range of between 160 and 25,600. That range expands to between 100 to 102,400 when the “Extended Sensitivity” is set on the camera. This range of ISO settings provide the user with more creative freedom. Low ISO values allow the user to use large iris settings and shallow depth of field, even in scenes of bright light. The higher ISO values provide the user with more flexibility in dimly lit situations. A 54db gain setting can also be set to achieve high sensitivity in dimly lit scenes. The EOS C200 Digital Cinema Camera features our Dual Pixel CMOS AF (DAF) Technology. DAF is a breakthrough AF technology that uses the CMOS sensor. 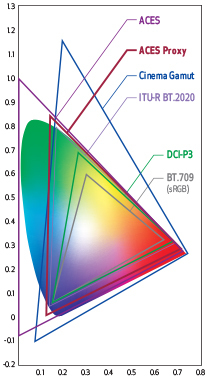 Each pixel in the camera's CMOS sensor is configured with two photodiodes. Two independent image signals can then be detected at each photosite. 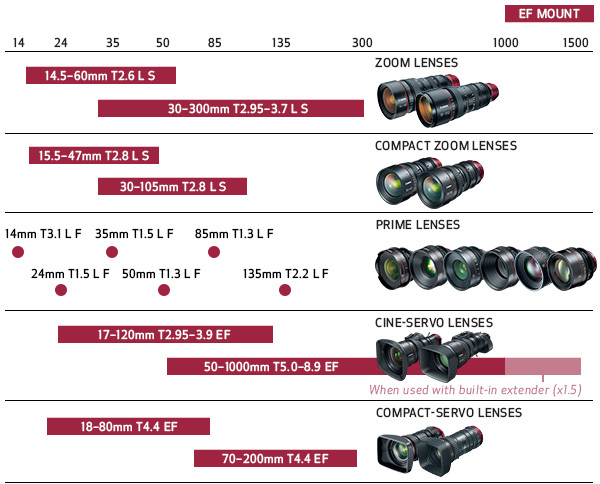 By implementing phase-difference AF, smooth focusing is accomplished using Canon EF lenses with much higher speed and accuracy than was possible with previous technologies- a major advantage during single-operator shooting. The EOS C200 has one-touch AF (with a push-button) and continuous AF within approximately 80% of the overall image area. 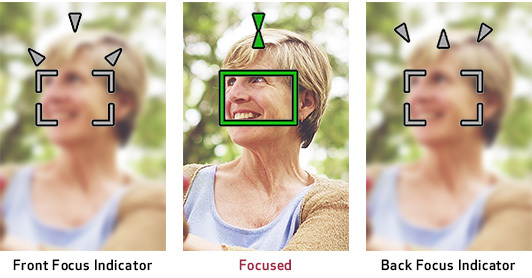 Face Detection AF is another autofocus mode that can track a person's face in the frame and maintain focus on them. To further fine tune AF performance, the EOS C200 offers the ability to set the AF tracking speed (up to 10 steps) and sensitivity (up to 7 steps) to match the user’s preference. Achieve faster focus with the included Touch Screen LCD Monitor (LM-V1), a new accessory with touch screen support. Tapping the area of the frame quickly brings the image into focus. This ability to choose the subject for focusing with the tap of the screen helps to make focusing intuitive. 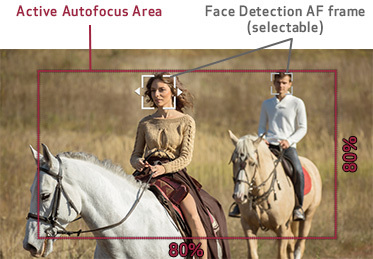 The camera's Dual Pixel Focus Guide takes advantage of Dual Pixel CMOS AF data to display focus assist information on the screen. The innovative user interface applies Dual Pixel CMOS AF technology to provide the user focus feedback. 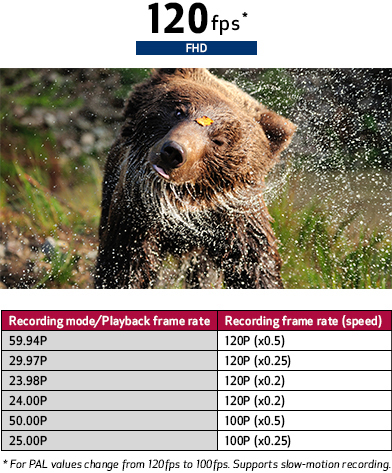 This lowers the barrier for focusing, especially when shooting in 4K, which requires strict focus accuracy. The camera also has a focus pre-set feature. Separate predetermined focus points can be selected and when the SET button is pushed, the lens will move focus from one mark to the other. This is especially useful when focusing in scenes with multiple subjects. 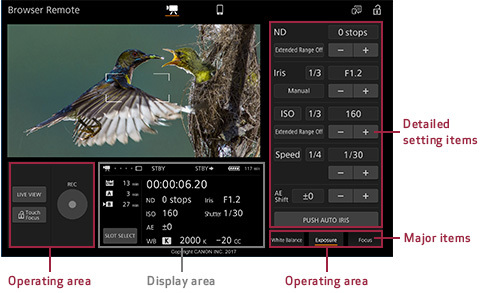 A newly developed menu function has been added for Auto-Focus tuning, allowing easy access to camera and lens settings. The AF Speed Tuning function allows users to set the lens drive speed to any of 10 steps. AF subject tracking characteristics can also be varied and set to any of 7 steps, allowing the user to select the appropriate responsiveness when changes have occurred in the subject. The EOS C200 Digital Cinema Camera features Canon's newly developed Cinema RAW Light, a 4K RAW recording file format offering a smaller file size compared to our standard RAW*1 files, while maintaining the same high resolution, high color reproducibility, and wide dynamic range data to provide dramatically greater freedom in grading and compositing. 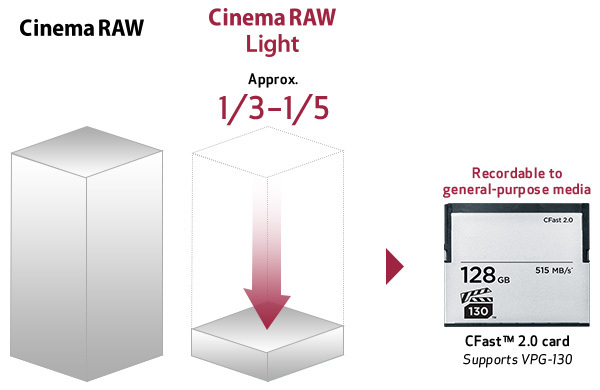 CFast 2.0 Cards with a VPG130 rating must be used when recording with the Cinema RAW Light format. Designed for high-end video recording, the VPG130 specification enables a sustained capture of video streams up to 130 MB/s. Cinema RAW Light files can be transcoded to other commonly used file formats, such as DPX or ProRes for later editing and online delivery using Canon's CRD software. The EOS C200 Digital Cinema Camera offers 4K UHD and Full HD recording in MP4 format, up to 60fps. 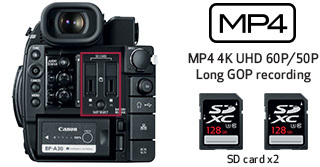 The compact size of the MP4 codec allows the EOS C200 to capture images directly to low cost SD cards. 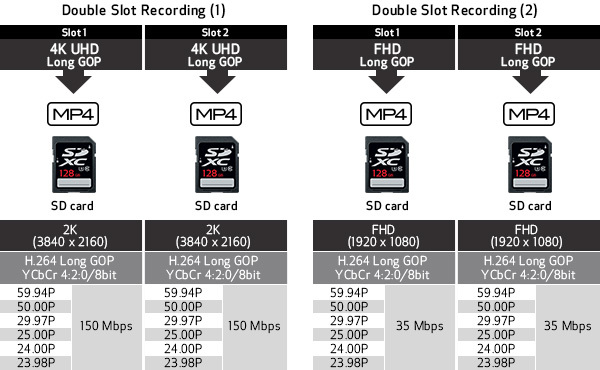 Mirror recording of 4K UHD/Full HD MP4 image files to the camera's two SD slots is possible, saving time and effort of having to make copies of the data after recording. The EOS C200 Digital Cinema Camera supports high-speed recording in Full HD at 120p/100p fps to enable additional creative freedom for slow motion replays and other special effects. 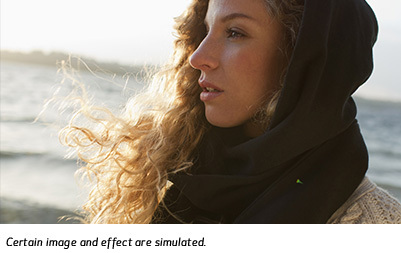 It's capable of a maximum 120fps, realizing even greater emotion in visual expression. The EOS C200 Digital Cinema Camera offers a variety of professional workflows. The camera's new Cinema RAW Light format provides professional shooters with the widest dynamic range and highest color fidelity for post production work. Using Canon's CRD software and Canon RAW Light codec with up to 15 stops of dynamic range is achievable. MP4 recording is also possible on the camera for situations such as newsgathering, where capturing the image and speed through post are priority. The EOS C200 supports both ACES 1.0 and HDR imaging through support for emerging HDR standards. Canon is working closely with 3rd party developers to help ensure maximum compatibility for these new formats with NLE and grading systems. The EOS C200 supports both Canon Log and Canon Log 3 Gamma. 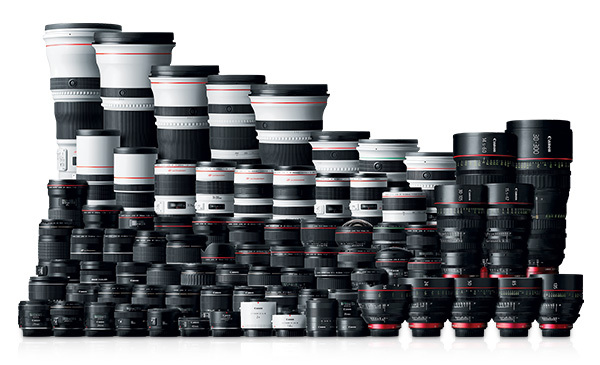 Canon Log is designed to reproduce, in post production, the entire tonal range that the CMOS image sensor is capable of. Log workflow provides the user with higher dynamic range, more highlight and shadow retention, and more flexibility in grading. Canon Log 3 is ideal for professional end users that want to get the most out of the camera system, and provides the most versatility for post production when recording in camera. When using Canon RAW Light and Canon's RAW development software it is possible to additionally use Canon Log 2 allowing for a total of 15 stops of dynamic range out of the camera. Using this method requires additional post production time over other options, but gives the highest quality and flexibility for post. The EOS C200 provides the Canon Wide Dynamic Range Gamma function that allows users to get many of the benefits of Canon Log Gamma while maintaining an 18% gray point similar to Rec. 709. By using this setting, users can maintain the full dynamic range of the sensor without the need for extensive post processing. 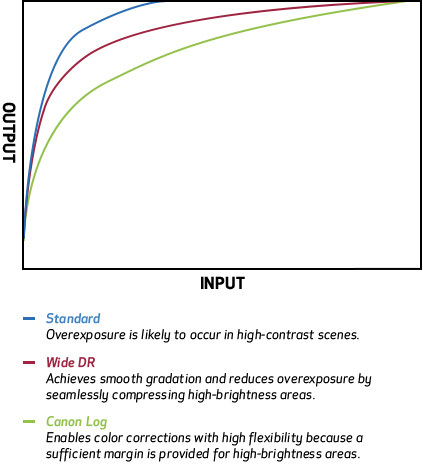 Use of Wide DR Gamma can greatly reduce post production time while maintaining very high image quality. 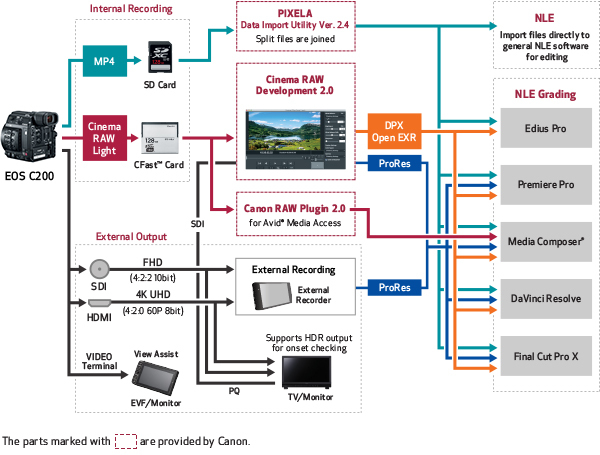 Canon has developed a mature workflow for the EOS C200, Cinema RAW Development 2.0, which supports the new Cinema RAW Light format and is provided as a free download. In addition to new development process support, it also brings features from the previous release including support for HDR monitoring, Canon Log Gammas, ACES 1.0 and more. Canon RAW Plugin 2.0 for Avid® Media Access is provided as a free download, which allows users to directly import Canon Cinema RAW data into an Avid Media Composer® system. This helps streamline the workflow, while enabling stress-free real-time playback and reducing file ingest wait time. CThe EOS C200 Digital Cinema Camera supports HDR recording in the ITU-R BT.2100 standard (PQ). HDR on-set monitoring is possible using HDR compatible reference displays, including all of our Canon 4K UHD Reference Displays. The Electronic Viewfinder can be used with a new View Assist feature, providing a reference view that's close to the PQ standard. 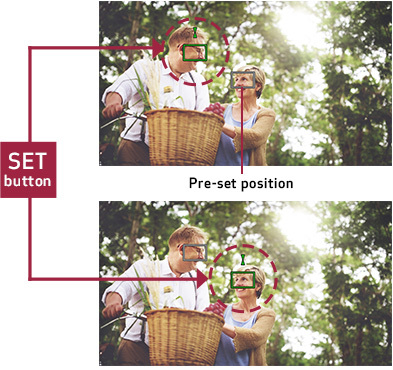 Using this View Assist feature, the displayed dynamic range can be selected for 400% or 1600%, and linear display as well. 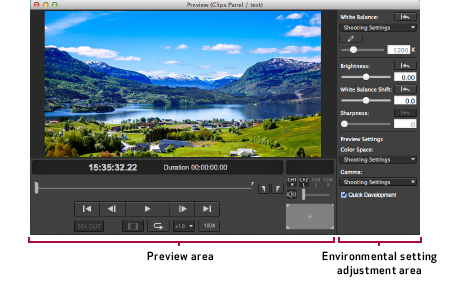 This allows operators to shoot HDR footage while getting a preview of the finished product. 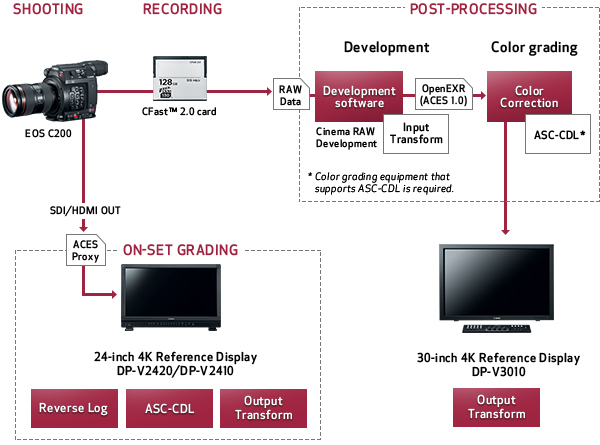 The EOS C200 Digital Cinema Camera supports the Academy Color Encoding System (ACES 1.0). 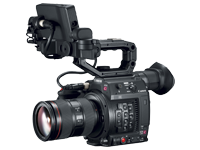 Using Canon supplied IDTs, images captured on the EOS C200 can be imported directly into the ACES compatible systems. In addition, video output from the camera can be monitored by selecting the ACESproxy. ACES proxy allows the camera to send a monitor output that simulates ACES space to a compatible monitor or device. Modifications made using the proxy output can be saved and later brought into the editing or grading suite to help insure changes and color choices made on set are accurately reproduced in post. 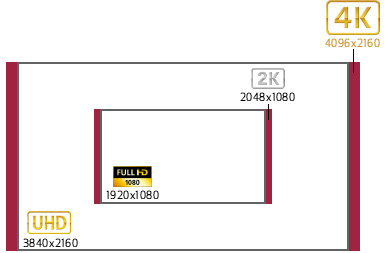 ACES image display is supported in Canon's full line of 4K UHD Reference Displays. The EOS C200 Digital Cinema Camera has a wide range of terminals that can be useful in a variety of production shooting and display situations. * 1: 2048×1080 signals will have black bands added above and below. * 2: YCbCr 4:2:0 8bit when the frame rate is 59.94P or 50.00P. * 3: Output will be YCbCr 4:2:2 8 bit when the recording mode is slow motion mode. * 4: The recording mode of slow motion is excluded. RAW recording is not supported. The EOS C200 Digital Cinema Camera features in-camera ND filters to help save production time and help increase shooting versatility without the need to change filters. The internal ND filters are selected with the ND FILTER + and - buttons on the left side of the camera. 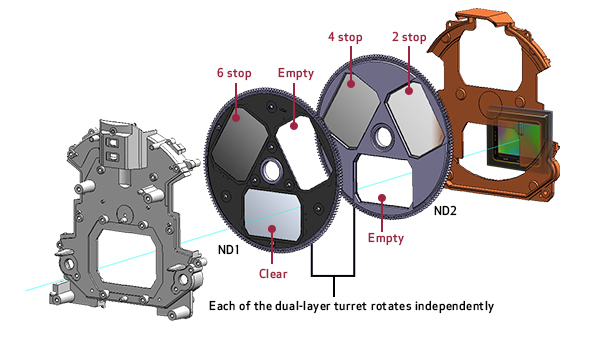 The camera uses an internal, motorized ND assembly consisting of two rotating disks with glass ND filters between the rear of the lens and the front of the sensor. This combination of ND filters allows 5 steps of neutral density. In normal mode 2, 4 and 6 stops are available. In extended mode, 8 and 10 stops are also available. Neutral density filters allow the operator more control of exposure in bright scenes, especially where shallow depth of field is desired. 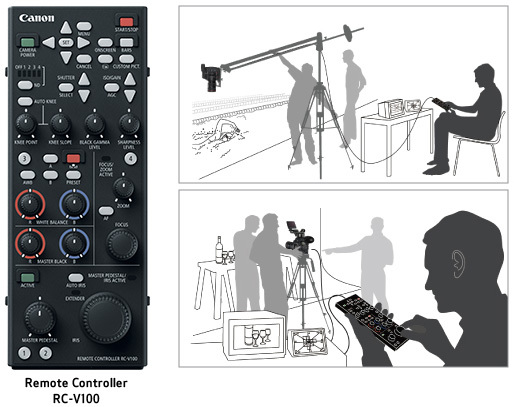 Camera settings can be accessed and controlled from a distance using Canon's RC-V100 Remote Controller. The RC-V100 plugs into the EOS C200 through the remote terminal on the rear panel. This optional accessory allows image quality adjustments and camera operations to be set from a distance. Focusing, aperture and zooming operations can also be performed remotely using the Link-up feature with Canon CINE-SERVO lenses. Some applications require the camera to be located a distance away from the operator, such as on a crane or jib. The ability to perform remote operation of camera functions in these situations can be critical. 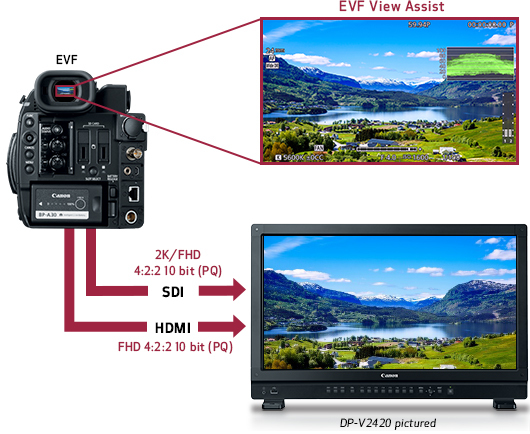 Multiple camera operations can be performed on the EOS C200 from a connected device (such as a pc, tablet or smartphone) by accessing the Browser Remote with a general-purpose browser. A wide range of auto focus functions can also be controlled using the Browser Remote, including the ability to move the focus area with just a touch when using a compatible tablet or smartphone. Manual focus can also be controlled from the Browser Remote, helping to ensure accurate focus from remote locations where manual focusing is not possible. A live feed from the camera can be displayed simultaneously from multiple connected devices accessing the Browser Remote. One device can be used to check focus, while the client or director can monitor the live action from another compatible device. 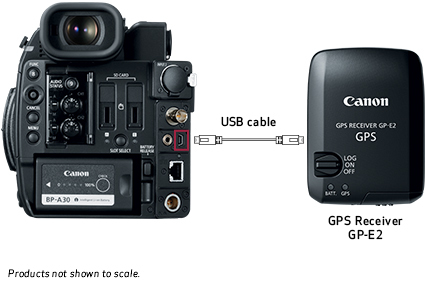 The optional GPS Receiver GP-E2 is compatible with the EOS C200 and can be connected to the camera using a USB cable, providing location and time information that is recorded during shooting. The GPS Data helps support editing work and adds more useful information for archiving purposes. Learn about the new EOS C200 and EOS C200B Digital Cinema Cameras which bring the performance of the Cinema EOS system to a wide range of shooters looking for high quality digital imaging at an affordable price. Director Andrew Fried and DP Bryant Fisher team up for the first film shot on the brand new EOS C200. 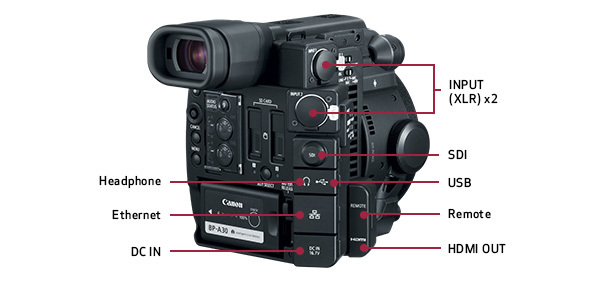 The film showcases the many features of the versatile new EOS C200. Go behind the scenes with director Andrew Fried, DP Bryant Fisher, and the crew of “From Dock to Dish,” shot in 4K on Canon’s brand new EOS C200. Even with today’s advancements in digital photography and cinematography, being precisely in focus isn’t that easy – especially when doing it alone. Directed by Brett Danton with creative director Matt Johnston from Spark44, the commercial was shot using the EOS C200 Digital Cinema Camera in Cinema RAW light except for one shoot on a EOS C700 for comparison and intercutting between cameras in Queenstown New Zealand. Behind the scenes footage in 4K.